Marie and Pierre Curie were married scientists who discovered radium (on December 21, 1898). They announced their findings a week later, on the 28th of December. 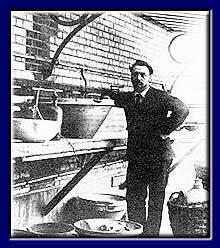 After forty-five months of additional work, the pair first isolated radioactive radium salts (from mineral pitchblende) at their Paris laboratory (on the 20th of April, 1902). The following year, they shared the Nobel Prize in science for their groundbreaking work. 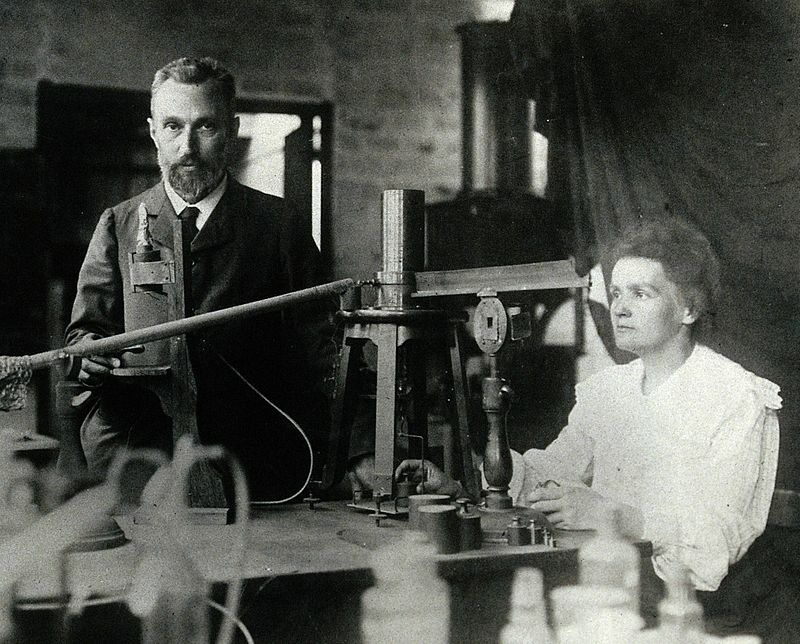 On April 20, 1902, Marie and Pierre Curie successfully isolate radioactive radium salts from the mineral pitchblende in their laboratory in Paris. In 1898, the Curies discovered the existence of the elements radium and polonium in their research of pitchblende. One year after isolating radium, they would share the 1903 Nobel Prize in physics with French scientist A. Henri Becquerel for their groundbreaking investigations of radioactivity. Marie Curie was born Marie Sklodowska in [the "New Town" of] Warsaw, Poland, in 1867. The daughter of a physics teacher, she was a gifted student and in 1891 went to study at the Sorbonne in Paris. With highest honors, she received a degree in physical sciences in 1893 and in mathematics in 1894. That year she met Pierre Curie, a noted French physicist and chemist who had done important work in magnetism. Marie and Pierre married in 1895, marking the beginning of a scientific partnership that would achieve world renown. Looking for a subject for her doctoral thesis, Marie Curie began studying uranium, which was at the heart of Becquerel's discovery of radioactivity in 1896. The term radioactivity, which describes the phenomenon of radiation caused by atomic decay, was in fact coined by Marie Curie. In her husband's laboratory, she studied the mineral pitchblende, of which uranium is the primary element, and reported the probable existence of one or more other radioactive elements in the mineral. Pierre Curie joined her in her research, and in 1898 they discovered polonium, named after Marie's native Poland, and radium. While Pierre investigated the physical properties of the new elements, Marie worked to chemically isolate radium from pitchblende. Unlike uranium and polonium, radium does not occur freely in nature, and Marie and her assistant Andre Debierne laboriously refined several tons of pitchblende in order to isolate one-tenth gram of pure radium chloride in 1902. On the results of this research, she was awarded her doctorate of science in June 1903 and later in the year shared the Nobel Prize in physics with her husband and Becquerel. She was the first woman to win a Nobel Prize. Pierre Curie was appointed to the chair of physics at the Sorbonne in 1904, and Marie continued her efforts to isolate pure, non-chloride radium. On April 19, 1906, Pierre Curie was killed in an accident in the Paris streets. Although devastated, Marie Curie vowed to continue her work and in May 1906 was appointed to her husband's seat at the Sorbonne, thus becoming the university's first female professor. In 1910, with Debierne, she finally succeeded in isolating pure, metallic radium. For this achievement, she was the sole recipient of the 1911 Nobel Prize in chemistry, making her the first person to win a second Nobel Prize. She became interested in the medical applications of radioactive substances, working on radiology during World War I and the potential of radium as a cancer therapy. Beginning in 1918, the Radium Institute at the University of Paris began to operate under Curie's direction and from its inception was a major center for chemistry and nuclear physics. In 1921, she visited the United States, and President Warren G. Harding presented her with a gram of radium. Curie's daughter, Irene Curie, was also a physical chemist and, with her husband, Frederic Joliot, was awarded the 1935 Nobel Prize in chemistry for the discovery of artificial radioactivity. Marie Curie died in 1934 from leukemia caused by four decades of constant exposure to radioactive substances. Clip from "Six Experiments That Changed the World" (1999-2000), from Channel 4. Online, courtesy BFI National Library. Quoted passage from The History Channel's "This Day in History." Bos, Carole "Marie and Pierre Curie and Radioactive Radium" AwesomeStories.com. Apr 05, 2013. Apr 20, 2019.